Classes for this year are wrapping up due to our filming schedule. New classes will resume in May 2019! We offer Baths, full grooms, face, feet, bum trims and much much more! If you think cold noses, wagging tails and the happy sounds jingling dog tags make are some of the best experiences this world has to offer, we would love to welcome you to BRB K9 as kindred spirits. Established in 1990 by Sherri Davis, BRB K9 has its roots in Obedience and Sport Training but has grown to encompass many more services, such as Boarding, K9 Day Academy of Fun and Grooming. We are all about dogs, but we won’t let things go to the dogs. Our dedicated staff are actively involved in ensuring your four legged friend is pampered during one of our grooming sessions, or having a “woofing” good time while at daycare or boarding. Our training classes are offered in small groups where Sherri Davis will be on hand to guide you and your furry friend to master that new Obedience Command. Regardless of what your problem may be; lunging, barking, digging, pulling on the leash or jumping, we guarantee a changed dog by the end of your six-week obedience course. 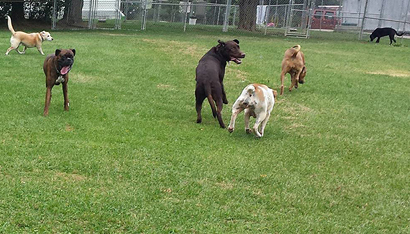 We offer a wide variety of fun interactive classes for you and your furry friend. Whistle Recall, Fun and Trick, Search & Rescue and Agility are just a few of the exciting classes your dog would love to participate in. Each class also has additional staff on hand to assist you and your pet to reach that next level.